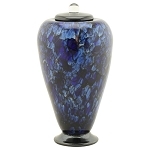 The Sera Hand Blown Glass Urn is a beautiful cremation urn for ashes, featuring a swirling, dream-like pattern of blues, browns and purples that can only be achieved by a skilled glass-blower. 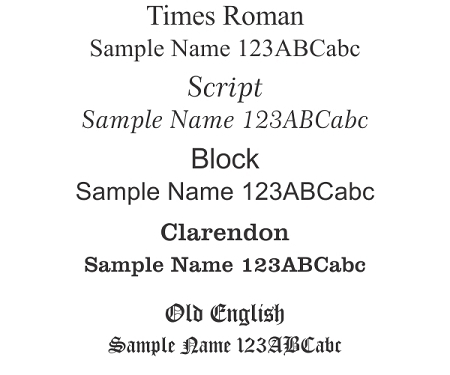 These artisans are trained in the same traditions that go back to medieval Italy and before. This vessel is tall and cylindrical in shape with a ruffled, flared top and marble stopper. Given its handcrafted personality, each glass urn varies in size, shape, and appearance from the image displayed; no two are ever quite alike. 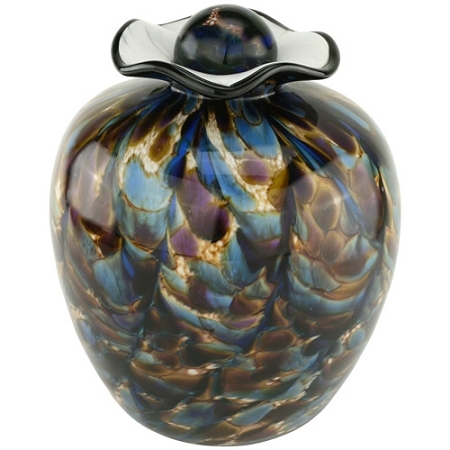 Each Sera Hand Blown Glass Urn is a unique, one-of-a-kind work of art. 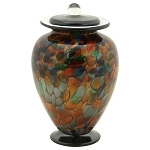 Every glass cremation urn, like the ashes of the loved one that are contained therein, is a special monument and a testament to a life well lived. Created by mixing pigments within the molten glass, one never quite knows how the final glass urn will look until it is completely cooled; much like understanding that each one of us has a story to be written with perhaps the most beautiful moments at the very end. 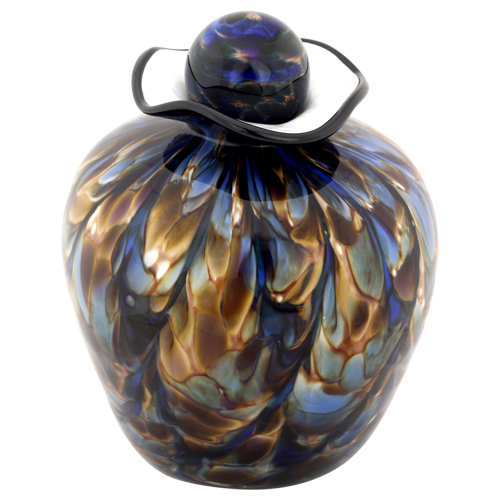 The Sera Hand Blown Glass Urn is crafted in the USA. 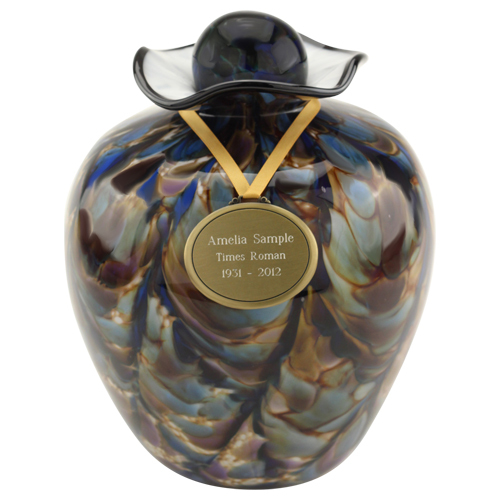 This glass urn can be made truly personal through an engraved oval pendant. 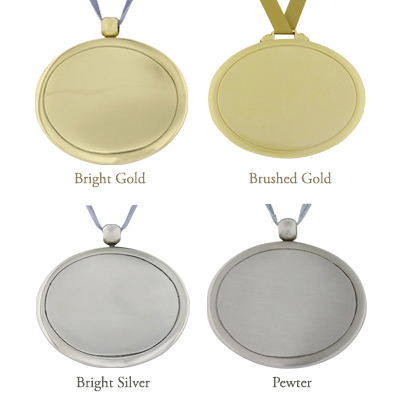 In your choice of gold or pewter, the pendant can be engraved with a loved one's name, dates, and other meaningful lines. 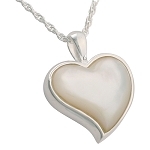 The pendant is presented on a satin ribbon that can be draped around the neck of the urn. Lid Rests on Top, Can Be Sealed with Adhesive if Desired. 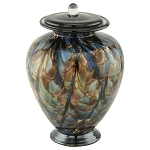 The Sera Hand Blown Glass Urn is an American made cremation urn for ashes, which features a lovely swirl of colors in blue, brown and purple.